Does dessert get any more Christmassy than this? Even the name is joyous - Eggnog Trifle Cake. Why would't you want Eggnogg and Trifle and Cake in the same wonderful dessert? As with everything at the moment - I got the recipe from the Good Housekeeping Christmas magazine, but will duplicate it here. I am halfway through making this scrumptiousness. 1Sprinkle the gelatine over 2tbsp of water in a small bowl and leave to stand for 5min. Meanwhile, mix the cornflour with 5tbsp milk in a pan. Stir in the remaining milk and the sugar. Bring to the boil and heat gently, stirring until the mixture has thickened. 2Stir in the soaked gelatine until it dissolves. Turn into a large bowl, stir in the 200ml (7fl oz) of Advocaat and leave to cool completely. 3Line the base of a 20.5cm (8in) springform tin with baking parchment. Scatter the crushed biscuits evenly over the base, then drizzle with the 4tbsp Advocaat. 4Whip half the cream until slightly thickened and fold into the Advocaat mixture. Whisk the egg whites in a spotlessly clean, grease-free bowl until soft peaks form, then fold into the cream with a large metal spoon. Pour a third of the mixture over the biscuit base and tap the tin on the surface so the custard fills the gaps between the biscuits. 5Spoon half the washed raspberries in a layer over the custard, making sure some of the fruit sits against the side of the tin – so the raspberries show when the tin is removed. Add half the remaining custard, then another layer of raspberries and the rest of the custard. Cover and freeze overnight. 6Run a warm knife around the edges of the trifle cake to release it from the tin. Lift it out of the tin and peel away the paper. Return to the tin. Whip the remaining cream with the icing sugar and spread over the top. Freeze until firm. 7Run a warm knife around the edges of the trifle to loosen. Carefully remove from the tin and put on a flat serving plate. 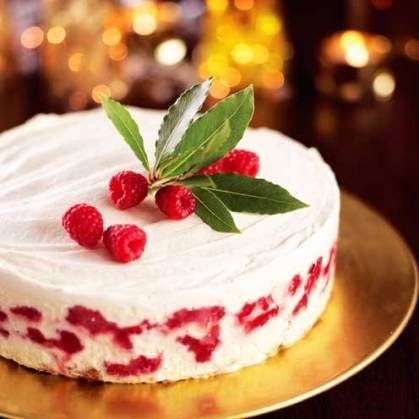 Transfer the trifle cake to the fridge for 3–4hr before serving, then decorate with the whole raspberries and the bay leaf sprig.